If you’re an avid follower of the blog, you know my motto is always to go vintage. Whether it’s handbags, jewelry, or clothing, I’d much rather spend my hard earned cash on classic and unique than what’s popular at the moment pieces. For example, my vintage Louis Vuitton cosmetic bag that I’ve had for years is probably the most popular bag I have because no one else has it! One of the pieces I love to collect is vintage Chanel especially bags and jewelry. Over the years, I’ve learned from experience and bit of research about buying authentic vintage Chanel bags. Every time I’ve walked into a consignment shop, I’ve studied vintage Chanel bags and asked a lot of questions. Plus, I’ve done the shopping myself and have learned the questions to ask and the resources to use before I buy. You guys asked me for the best tips for buying a vintage Chanel bag. 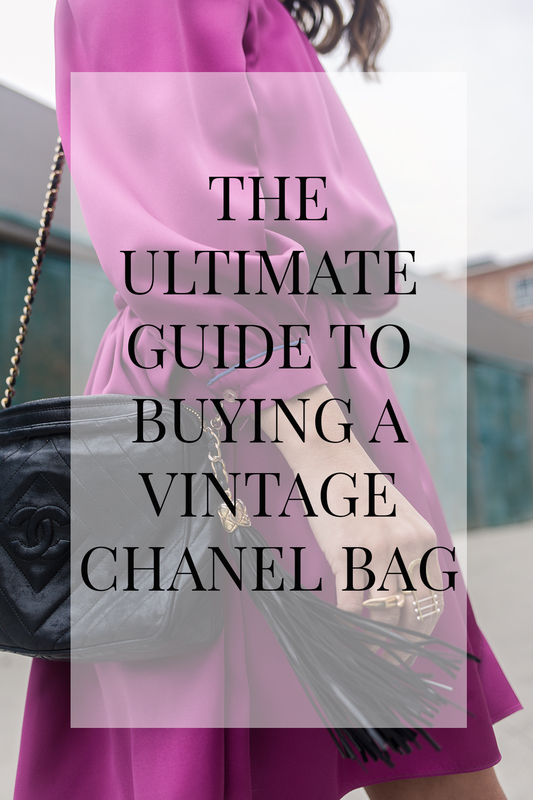 After months and months (part of it was me lagging actually sitting and writing), I’ve pulled together all the intel, info, and tips to help you shop for and buy your perfect vintage Chanel bag. eBay. Of the hundreds of sellers, I trust Fashionphile the most, plus they have brick and mortar stores in Beverly Hills, San Diego and San Francisco that you can shop in person. You can also check out this list of Chanel resellers, which includes eBay sellers as well as other online retailers. Farfetch. Farfetch is a luxury retailer that recently started selling vintage. They have a great vintage Chanel bag collection and are a reputable seller. Note that their prices are higher since they have done the hard work of finding the most unique vintage pieces to add to their inventory. Malleries. Malleries is an online shop specializing in luxury items from premier brands such as Hermes, Chanel, Louis Vuitton, Bottega Veneta, Valentino, Emilio Pucci, Alexander McQueen and more. It’s similar to Etsy in that there are many different sellers, a wide selection of new and on-trend items to unique, vintage bags. Vestiaire. Vestiaire Collective is a curated collection of thousands of new, pre-owned, and vintage luxury items. They check every item to ensure quality and authenticity before it is sent to you. Shop around. If there is the best tip for buying a vintage Chanel bag, it’s to do lots of research and shopping around before you buy. This helps you narrow down the style you want, but also gives you access to various types of bags and prices. Trust your gut and use common sense when shopping. If a certain bag is way underpriced as similar bags on other sites, then it’s likely a fake. But if the pricing is pretty consistent, then dig deeper to ensure it’s authentic as well as check the store policy. Check the store policy. Each shop and even each seller on eBay or Malleries will have it’s own return policy, shipping rates, and other specific shopping policy. Be sure to read every store policy before you buy. Get all the details. Find out everything you can about the vintage Chanel bag including if it comes with the dust bag and box. All resellers should provide an authenticity card or certificate of authenticity. 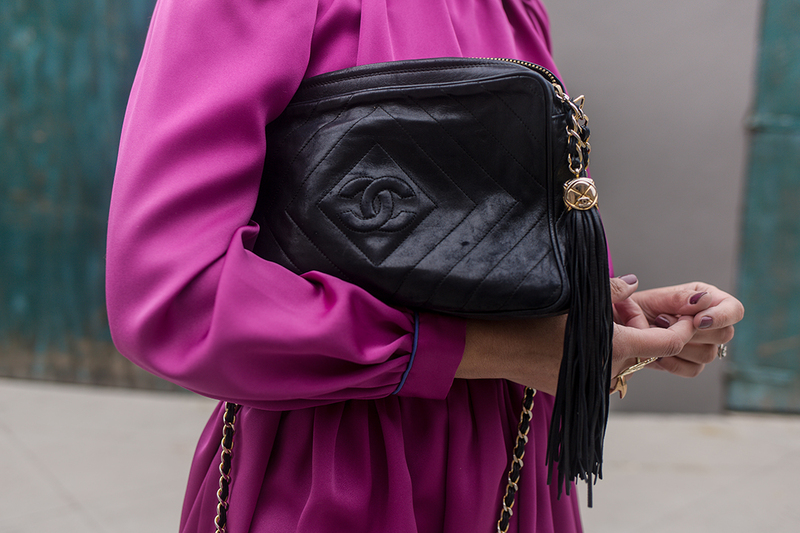 This is one of my other tips for buying a vintage Chanel bag; find out everything about the bag that you can. If it sounds too good to be true, then maybe it is. Ask for pictures. Every shop will include pictures, but they may not be exactly what you want, so ask for additional pictures. For example, I always want to see a handbag modeled so I will ask for images with the purse carried as a messenger, shoulder, and also carried as a clutch. Double check measurements. Pictures can be deceiving and sometime they make a bag look larger than it actually is. In addition to asking for more pictures, ask for exact dimensions of the bag. Stitching. The devil is in the details as they say, so check for straight stitching pattern. Also, all of the stitching should line up and meet where the flap folds over in front of the bag. If the handbag comes with a small pocket on the backside, then the stitching should line up here as well. If the stitching is crooked and doesn’t line up, then you are most definitely looking at a fake bag. Authenticity Card & Serial Number. All Chanel bags should come with the authenticity card and have the hologram sticker and they should have matching numbers. Note that bags before 1980s don’t have hologram stickers, but anything produced mid-1980s onward should have both a hologram sticker and authenticity card. Fake bags will come with hologram stickers and authenticity cards! Google the serial number and run a reverse Google image search and see if the number pops up. If it does (and if it’s for an active listing), then you know it’s a fake. Serial numbers are like fingerprints, they are unique to the individual bag. Check the Cs. On Chanel bags, the CC stitching and CC lock has a distinct pattern: the right C should overlap the left C at the top and the left C should overlap the right C at the bottom. Chanel Boutiques do not authenticate bags; I rely on Leather Surgeons or Meme’s Treasures for authentication of my designer handbags. If you’re buying from an online store that doesn’t offer returns or you’re looking for an online authentication, then turn to The Purse Forum community as a back up. You can submit information, links, and images here and The Purse Forum community will review and authenticate for you. Note that not all requests are answered. TPF is also a good resource for tips for buying a vintage Chanel bag, although you’ll have to read through threads and threads of various comments to find tips. Check out my Tips for Buying a Designer Bag for Less. So many great tips here! Love this vintage Chanel and I’d love to own one one day! I’ve always wanted a vintage chanel. Thanks for these buying tips! Loved this. Swooning over your vintage bag! So chic! This is great advice. I’ve been wanting to invest in a vintage chanel bag (I’ve been on the hunt for a chanel fanny pack) but I honestly have no idea where to start. This is awesome. Ahhhh this one is so cute!!! I’m fairly certain I could never afford one, but I’m bookmarking this post just in case! i love Farfetch, they have so many great pieces and an amazing vintage section! So many great tips! Thank you so much for sharing! SO many great tips!! I have always wanted to find a great vintage Chanel so I am def. saving this post! Many great tips you’re sharing. I’ll definitely keep this in mind when I go shopping for a vintage chanel bag. amazing tips. i have been thinking about a vintage chanel for awhile now, and the process had always seemed so overwhelming. thanks for sharing! love the one you got! So many great tips! Definitely saving this post! Love these tips! I want a Chanel bag so bad! Thank you for sharing your great tips. I’m saving this for the future! I love your bag! I bought my vintage Chanel via Shopbop! I would loveee a vintage Chanel! That vintage piece is absolutely beautiful! Love this vintage piece! I’m always on the lookout for new places to snag one! Great tips, this bag is so stunning!! these tips are fabulous and so needed! it’s easy to get ripped off by a variety of suppliers, it’s important to find one that is both quality and trustworthy!